HOUSTON, Texas (KTRK) -- Emerging from a meeting that surpassed an hour with Mayor Sylvester Turner and senior members of his administration Monday afternoon, firefighter union president Marty Lancton said simply, "We don't have an agreement." There was some hope. Monday's meeting was the second in four days. 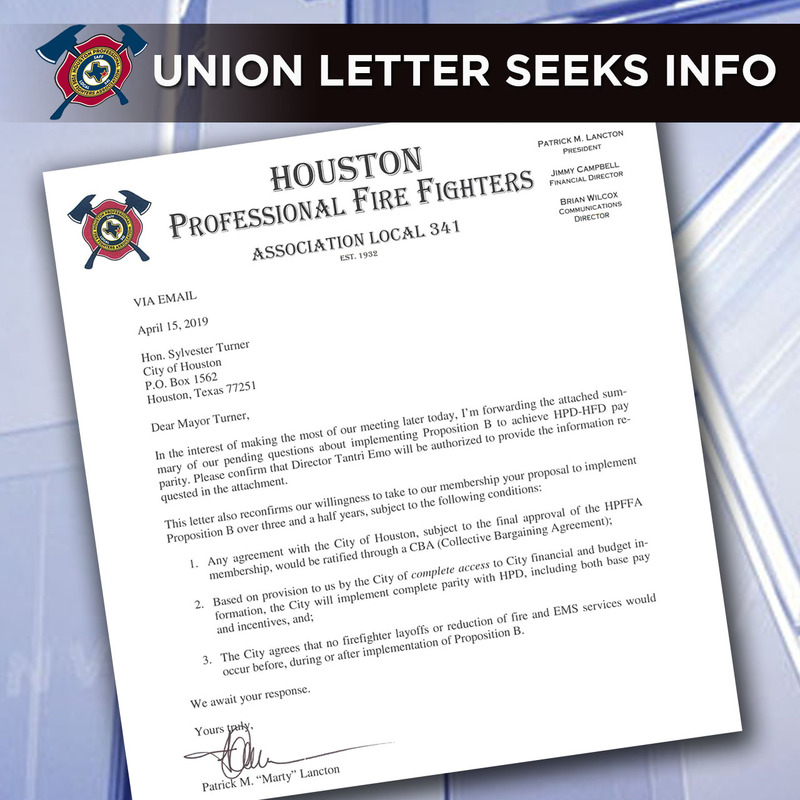 In the hours before Monday's meeting, the union sent the mayor a fill-in-the-blank chart asking for details on what firefighters would be paid under the mayor's proposal. "There's a very simple template," Lancton told reporters. "What are the pays and what each rank has. Unfortunately, we still are no closer to getting that information today than we were Friday." It is a similar request to one made by the union on Friday and several times before. While the mayor did turn over some financial data in the Monday session, the union says it did not include details they've asked for, nor include incentive pay, which makes up a substantial part of police officer pay. The entire point of Prop B is to bring parity or equality to pay between Houston police officers and firefighters. Houston city council member, Dwight Boykins, called Monday "another sad day" in the history of Prop B. Boykins reminded reporters following the meeting that council will be asked to approved the mayor's plan to lay off 220 Houston firefighters on Wednesday. Boykins vows to delay the vote if the financial details aren't turned over by then. Mayor Turner released a letter Monday following the session telling Lancton. "The city is committed to all parties returning to the table to work out a collective bargaining agreement." Turner said, adding if a deal can be reached covering Prop B, the city would put in a "future collective bargaining agreement." The mayor is sticking to his proposal to insist firefighters have the same college degrees police officers need for promotion-based raises. That does save the city money, but was not in the voter-approved ballot proposal. 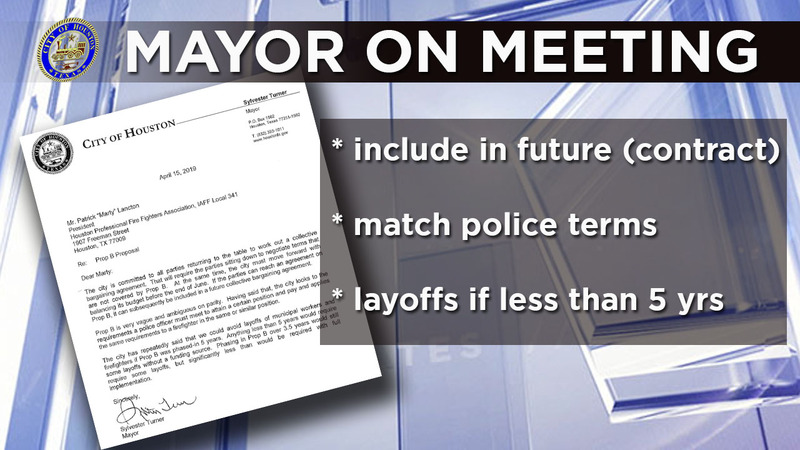 The mayor also reminded Lancton any deal short of five years would include layoffs. Also Monday, lawyers for African-American firefighters went to federal court asking a judge to block any city meeting that would alter opportunities for minority improvement. Those firefighters insist prior court rulings are on their side and protect their position. No hearing is set on that temporary restraining order, but lawyers hope to be before a judge this week.